Residents selected “Common Threads,” a concept by Durango artists Allison Leigh Smith and Bryce Pettit, for the U.S. Highway 550/160 intersection earlier this year. The piece will incorporate symbols submitted by residents, not necessarily those in this early rendering. Artists will have to scale back plans for an art installation planned for a busy intersection in Durango after the city missed out on a grant worth thousands of dollars. 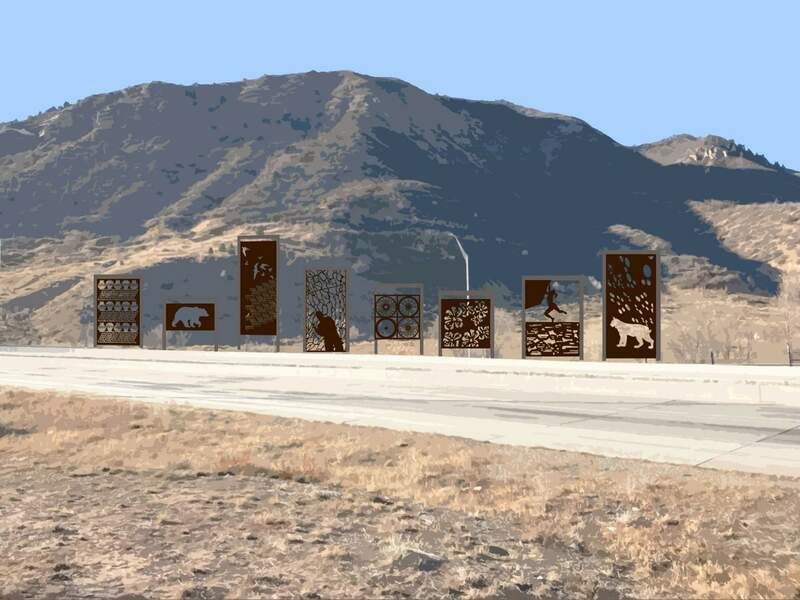 The new installation at the DoubleTree intersection, where U.S. Highway 160 connects with Camino del Rio, is expected to feature laser-cut metal panels displaying symbols representative of Durango. The panels will be installed up and down the long, narrow medians at the intersection. The art installation, called “Common Threads,” was chosen by residents through an online survey. The city of Durango already has a $25,000 grant from the National Endowment for the Arts for the project and plans to match the grant with $25,000 in cash and in-kind contributions. The city applied for a second $25,000 grant from the NEA that it also planned to match, but the city did not receive the funding, said Colleen O’Brien, business development and redevelopment coordinator, in an email to The Durango Herald. “We are restructuring the scope of the art project to fit within the $50,000 we already have allocated,” she said. Classes and workshops to involve residents in the planning of the metal panels have been occurring since May, and that work is expected to continue, O’Brien said. Artists Allison Leigh Smith and Bryce Pettit, who submitted the idea for the project, have held 26 events to involve the public, reaching six different schools and involving elementary through high school students, O’Brien said. Those public-engagement efforts have allowed residents to submit ideas about what symbols best represent Durango and could be incorporated into the new art installation. The artists have received about 250 submissions or ideas for symbols, Smith said. Mountains and bears have been among the most popular. But the artists also hope to incorporate some quirky and creative ideas, she said. O’Brien said she expects the smaller budget will affect the art installation. Steel prices have also increased dramatically, which will also have an impact. The artists originally expected to have between 15 and 30 panels, but Smith couldn’t say how many panels might be part of the project at this point, in part because the public outreach will continue through December. “I want to see everything we have got before we start getting creative with our new budget,” she said. The piece is expected to be installed in the next year, she said. To submit an idea for the project, visit durangocommonthreads.com.